Alright here it is, a compilation of my, as well as my friends’ katana reviews. Based on our experiences I’ll compare my top 3 favorite katanas that we have so you can get a framework for what to start with. I organized it from lowest to highest priced so you can get an idea of what to get depending on what type of funds you have at your disposal (if you’re like me it’s under $1,000). Why only 3 katana reviews? Well because I like things simple and hate being weighed down with lengthy content to read through. Just get to the point, which I’ll try to do. First of all, please don’t get this confused with the brand MUSASHI! You will notice a flood of cheaper priced (~$80) Musashi swords as you shop around. I’m not a fan, they usually are produced in mass numbers and lack the durability as well as blade sharpness longevity. In my mind they do a injustice to the legendary swordmaster Miyamoto Musashi for whom these style katanas are named after. If you are looking for a reasonably priced katana for sale and don’t want to break the bank the Paul Chen Musashi Elite by Hanwei is a good deal. This Hanwei katana not only looks beautiful but also is quite functional with a strong and clean edge that is very capable of cutting soft or hard targets. The photo below shows the bashi & kissaki. The edge is rated HR60 which is a metric (based on the Rockwell Scale) used to determine the hardness of steel when impacted by another substance, in this case a diamond cone. I believe the diamond bit is pressed into the tempered steel under a standard pressure and the depth it penetrates is measured. The higher the number, the harder it is. Since there are a number of types of steels different steels have different optimum Rockwell Hardness levels. Rough Forging: hot forging of high-carbon steel. Repeated hammering provides even dispersion of carbon throughout the steel for strength. Rough Shaping: Scale (iron oxide) is removed and the blade is shaped. At this stage, the steel is still in the soft state and the blade has not been given a curve yet (known as ‘sori’). Clay Covering: A special clay is applied to the blade with a thin layer near the edge and a thicker layer everywhere else on the blade. This causes a quicker cooling of the edge during quenching which provides a harder edge & softer back. Quenching: With the clay covering still on, the blade it is heated and quenched in water. The shape and continuity of the hamon, the sori, and blade straightness are all determined during this quenching process. Sizing: If necessary the sori is adjusted to set the point of percussion and balance point. After this the blade is de-scaled. This is followed by polishing and the fitting of the habaki. Finishing: Any blemishes are removed through fine polishing and the remainder of the katana parts are placed on the sword. The traditional double ring style tsuba is iron which provides a durable guard as well. It’s not the most decoratively designed tsuba I’ve seen however this style holds true to the traditional tsuba design. Finally I love that it came with a cleaning kit as well a sword bag, the complete package. The sword was designed to be a good economic cutting sword with the ability to make multiple cuts in normal targets without dulling. If the 1065 high-carbon blades weren’t something you were aiming for then I’d say skip down to one of the other two katana reviews I’ve provided overviews on here. Imagine finding the perfect balance of quality, price, sharpness, length, and style. 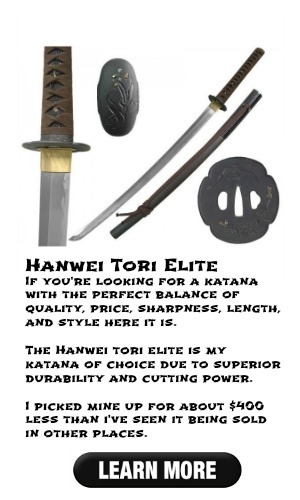 You have just imagined yourself with the Hanwei Tori Elite katana, my favorite sword. If you consider yourself serious in the realms of Japanese sword arts then this masterpiece should be in your arsenal. This is another of Paul Chen’s many masterpieces that doesn’t disappoint. The balance is perfect at 5″ down from the tsuba. Right where you want it within that 4″-6″ range. This provides for a clean swing, not too front heavy, not too tail heavy, so it is easy to recover from every cut quickly without tiring your arms out. The brown leather wrapped tsuka provides for a great grip. This is actual leather as well, not suede or some faux leather. Some aren’t a fan of the leather due to the more ‘tacky’ grip but I personally prefer it. Helps maintain better control. The photo to the right gives you an idea of the color of the fittings and the wrap. You can see there is a crane design on the pommel that adds a little extra flare to the overall aesthetics of the blade. The diamond patterns where the leather crisscrosses aren’t the same shape which is slightly annoying however it doesn’t affect the tightness of the wrap. Even the saya is a piece of art with ~9 inches being rattan wrapped (see below), which gives it the appeal of being a high quality luxury component. Not to mention the added benefit of a better grip which is important for performing noto (the sheathing and unsheathing of the sword). Another perk of the saya is that it is made to be ‘fingerprintless’ so you don’t need to worry about cleaning the smudge marks off after a sweaty practice with it. I’ve had this for about a year now and the blade has yet to run dull. Now I also don’t treat my katana poorly by slicing into sheet metal as I’ve seen other do. And to be fair nor do I use this katana every time I practice or cut, so it’s not a year’s worth of continuous use every week. I tend to alternate between a few different katanas. This katana features a hand crafted blade which is folded out of ASSAB K120 C Swedish steel, which if you remember from step 1 in the katana readiness guide, the folded steel is a high quality forging method. If you’re wondering what the difference is between other steels and the Swedish steel used in this katana you’re not the first but I’ll explain from what I know; Sweden has long been known for their excellent iron ore deposits throughout the country. Steel coming from Sweden usually has very few impurities as well as contain small percentages of other metal ores which make steel produced from it a natural alloy. This makes for a much more durable steel during & post forging. Cost, I know you are all curious. I’ve seen this sell for around $1,400 yet luckily I picked mine up for a little under $1,000. For my budget it was a perfect fit. Though I couldn’t afford a Praying Mantis or Furui Shishi, I also didn’t want to skimp out again as I had done in the past. All in all if you’re looking for the full package this katana delivers. Looking to go all out and have the Cadillac of katanas? A buddy of mine bought this sword and let me tell you, if I had saved all the money I spent on crappier katanas (and was a little taller) I would have this baby in a heartbeat. The Furui Shishi by Thaitsuki is a very nice katana, as are most of the upper end Thaitsuki katanas now. With a 29 1/2″ blade it is a little too long for me but perfect for anyone 5′ 8″ to 5′ 10″. This baby is remarkable right down to the saya (wooden hand rubbed lacquer finish). The blade is impeccable, I mean it cuts through bamboo like it’s a piece of cheese. This could be due to my friend’s skills being moderately better than those of my own or due to the clay tempered & water quenched blade. Clay tempered is a method used during the cooling process that involves spreading clay in varying thicknesses over a blade during the quenching process resulting in an exceptionally hardened edge and a softer body. The blade’s edge hardness is a 60HRC on the Rockwell Scale while the body is a 35HRC. Again this means that the edge will be harder which allows for a sharper blade while the body of the sword will be softer to prevent breakage and provides the correct flex. The Furui Shishi does have the groove or ‘bo-hi’ running along the top as well. The bo-hi (meaning ‘blood groove’) is cut into the katana to lighten the sword’s weight. This is something else you should think about when looking to buy a katana, is whether or not you would like the bo-hi style blade or prefer it without bo-hi. The bo-hi blades usually will run your more money though. Beyond functionality I think the blade’s hand polishing job really makes the grain standout. As with my Tori Elite, the tsuka on this one also has a beautifully braided leather overlay (I guess I’m just drawn to leather). I’m not the only one drawn to the feel of the leather though, a look through any other reviews of this sword and you’ll find a trend in what all the positive feedback is about; 1) the perfect balance of the blade and 2) the feel of the leather wrap for practice. The habaki & kashira on the sword are made using 98% pure silver, this gives it a different look from most others that use a brass, copper, or bronze. The tsuba though in my mind really isn’t all that decorative, it’s a pretty basic design (see below) so if you’re looking for the decked out artwork on the tsuba then unfortunately this sword will lack in that area. Another great perk of this katana is that it came with a stand as well as a cleaning kit which we all will need at some point. The stand comes in a dark black with engraving on the front of it. The high price makes it better? False. In terms of katana reviews I don’t think price is always an indicator of quality, heck look at Jaguar or Land Rover, dang things cost a fortune and they seem to be more susceptible to mechanical flaws than your standard priced Jeep. This however is a superior quality katana through and through and as a result of the exceptional quality is higher priced, not the other way around. Key takeaway: over my budget but if money isn’t an issue and you want unmatched quality here it is, the combination of clay tempered forging process and the close attention to balance in this blade’s weight dispersion makes it an exceptional katana for use in training or cutting practice. So there you have it, the top katana reviews in my mind. I hope you find these valuable and they provide some direction in terms of what models to start looking at whether you are interested in getting your first katana or just upgrade your current arsenal. Now after reading these katana reviews on to the next step of the katana readiness guide; “where do I find a katana for sale?” Well let’s get into that on the next page.